When I was growing up reading was a year-round daily activity. My parents took me to the library every Sunday, each of us leaving with a stack of books. My dad was in the Air Force and the libraries we visited changed with our frequent moves between military bases. Most bases had full libraries, and those that didn’t made a good effort to improvise. On Goose Bay Air Force Base in Labrador, Newfoundland, the library consisted of fifteen shelving units lined against a wall in the gym. Twice a month a plane delivered overflow books from libraries on larger bases in Germany. Sometimes the pickings were pathetically slim—ten copies of The Cat and the Hat, piles of tattered Louis L’Amour westerns, and German cookbooks. At AFCENT, a NATO base in the Netherlands, the library in the Department of Defense school made up for the lack of a local English-language library with a large fiction section called “For Adult and Almost Adult Minds.” I discovered my favorite writers, Trevor, Cheever, and Munro, in those aisles using my almost-adult 14-year-old mind. My parents also bought books, locating nearby secondhand bookstores or book swaps in our revolving communities. New books were a special treat usually saved for gifts and holidays. I assumed everyone read for fun and had books at home. I learned otherwise when I visited my new friend Maggie’s house in the third grade. She had bookcases in her bedroom, but they were full of everything but books. When I asked, “Where are your books?” she pointed at two books—The Grinch Who Stole Christmas and Good Night Moon—in a cabinet under her guinea pig’s cage. “I don’t mean your baby books. Where are your books from now?” I don’t have any other books, she replied with a frown. What about your library books I persisted, sure there was a misunderstanding. Her frown deepened. I liked Maggie, she was funny and loved animals, but if she didn’t go to the library and only had two baby books, I couldn’t imagine what she read. I wasn’t astute enough to realize she didn’t read outside of school. The phrase summer reading was introduced to me that year. Mrs. Byrd, the school librarian, gave my class a list of books to consider reading over the summer. She said summer was the perfect time to read books. I was perplexed. Why was summer a better time to read than other seasons? David, a mean kid who played too rough at recess, angrily asked “How can you make us read on summer vacation? That isn’t fair!” David evidently had other ideas for his summer that didn’t include books. She asked how many of us had library cards. I raised my hand and was shocked when only two other kids in the class raised theirs. Mrs. Byrd explained how easy it was to get a library card and arranged an outing for kids who wanted a library card before the school year ended. I was happy to see Maggie sign up, but I felt sad that her parents hadn’t gotten her a library card sooner. From then on summer reading lists were a part of every winding-down school year. In May teachers and librarians handed out lists of suggested summer reading titles for each grade level. I discovered that Maggie was the norm and that I, with my increasing pile of library cards for now distant libraries, was the minority. Most kids couldn’t wait to not have to read when school let out. Some schools held contests to encourage kids to read during summer. I was a judgmental observer of this gimmick. What kind of person needs the promise of a new gadget or $40 of McDonald’s gift certificates to read? I scoffed at the kids who returned to school in the fall showing off their new personal transistor radio or bragging about the delicious Big Macs they had eaten for free because they supposedly read the most books from the summer reading list. What a bunch of hogwash I thought—those kids didn’t want to read, they wanted to win. I never trusted kids who won the contests because when I asked them detailed questions about the books they could never answer beyond a flimsy reply anyone with eyes could put together after reading the book jacket and then they said I was just jealous. Maybe I was. I liked Big Macs too, but I wasn’t competitive enough to try to one-up kids who only read when prizes were involved. As I got older I read articles about summer reading in magazines and they too included recommended reading lists for adults who couldn’t decide what to read using their own adult mind. As a know-it-all teenager I equated those adults with the Big Mac-eating champion readers. My perspective changed when I took education classes in college. I learned about reluctant readers and the challenges of teaching students who only read what’s assigned in school. I read studies that demonstrate the difficulties of motivating boys to sit still enough to read. I realized that summer reading lists and contests weren’t gimmicks, but tactics to transition kids from being reluctant readers to active readers. I matured enough to see the connection between reluctant young readers and adults who don’t regularly read, and realized it’s never too late to become an active reader. Now when I see articles about summer reading and lists of books to bring on vacation, I’m happy that encouraging reading still trends this time of year. We know students who read captivating literature in school develop better reading habits outside of school, and Junior Great Books continues to introduce kids to the concept of reading for pleasure. At the Foundation we’re delighted when teachers tell us about reluctant readers saying things like, “I didn’t know reading could be so much fun!” and “I want to read more stories like this!” after participating in a Junior Great Books® program. We like to imagine kids choosing once-invisible books from their local library after discussing “Thank You, M’am” or “Harrison Bergeron.” Thankfully, June has arrived and another summer begins. May it leave all of the Maggie’s and David’s, whether in school or long out, searching for more good books after the season ends. Sharon Crowley works in K-12 marketing at the Great Books Foundation. She was a Junior Great Books student and is forever thankful to her fourth-grade teacher Ms. Lott for introducing her to the delight of discussing stories. Nice post, Sharon. I can definitely relate. I was an avid reader as a child. My boyfriend never read outside of school though, and at the age of 38 finally picked up the hobby and is so excited about it. Reading is now his favorite thing to do! The Great Books Shared Inquiry approach has been such an important part of my life as a teacher. I have watched students grow into thinkers, listeners and communicators. The stories within the anthologies are amazingly powerful. Still, there is so much work to be done. Pulling evidence is a key Common Core component, but the layering of text, researching, vocabulary etc. are also components where the Greats Books Foundation falls short (and persuasive writing, or writing in general). I spent probably 20 hours composing a "The Man in the Water" lesson(s) that had students investigating black box conversations, info regarding hypothermia, etc. 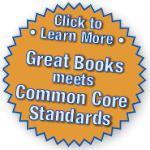 Layering text truly makes a common core lesson. I look forward to working further with the foundation. I am basing my curriculum on your program, but am making it TRULY common core. So much work! !